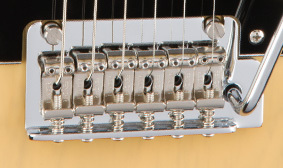 These pickups produce all the brilliant pristine, well-defined tone of vintage single-coil Strat pickups, with no hum. 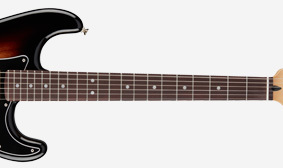 This instrument features a fingerboard radius (the amount of curvature across the width of the fingerboard) that, at 12", is substantially more flattened than both a vintage-style 7.25" radius and a modern 9.5" radius. Feels notably flat even though there’s still slight curvature—great for bending notes without fretting out. 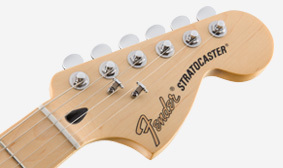 This Stratocaster features a two-point tremolo bridge with vintage-style saddles for superior intonation, sustain, tuning stability, tremolo action and ease of adjustment, along with an extra touch of original-era authenticity. This instrument features locking tuning machines for increased tuning stability and easy restringing. 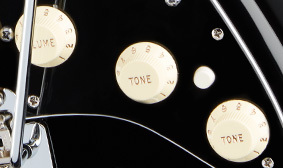 Placed discretely between the tone controls, the push/push mini-switch on this model activates the bridge pickup when the pickup selector is in positions four and five. 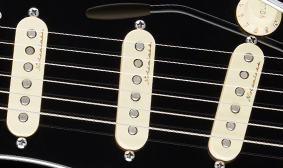 These new pickup combinations enhance the already flexible sound. 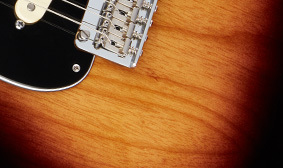 Strong and dense, ash is a longtime Fender classic for electric instrument bodies. Notably resonant and sweet sounding, it’s characterized by clearly chiming highs, well-defined midrange and strong low end. It also features an attractive grain accentuated by light-colored finishes.